The first framework to integrate projects, programmes and portfolios. Free digital web based framework for projects, programmes and portfolio management. Free capability maturity assessment tool, not only assesses the capability maturity of a project, programme or portfolio; but also acts as a checklist that can help you embed good practice. An entirely free, open source framework. Available on the internet and subject only to a Creative Commons licence. Apply and tailor the Praxis Framework to your organisation. Understand the similarities and differences between Praxis and other prominent frameworks; PRINCE2 and MSP - as well as the APM qualifications, PFQ and PMQ. The Bridging Course is for those who have previously undertaken project and programme training and would prefer to use a more integrated framework going forward. The course covers the similarities and differences between Praxis and other prominent frameworks; PRINCE2 and MSP - as well as the APM qualifications, PFQ and PMQ. 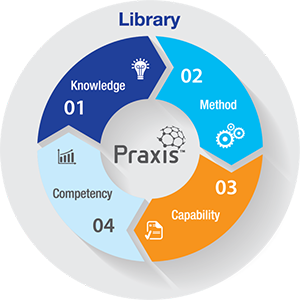 The PRAXIS Framework is a great day to day resource; you can access the entire framework anytime online to refresh your knowledge or look at something from a different point of view. What's more - all of this is free.